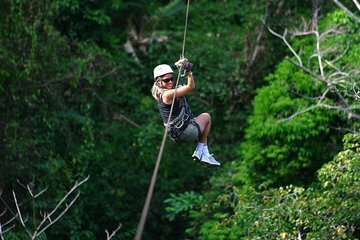 Soar above the jungle canopy on a half-day zipline adventure in San Ramon—a tour with special appeal for nature lovers. Breathe in the fresh mountain air as you zip through the treetops and enjoy sweeping views of Costa Rica's Central Valley. Learn about the cloud forest ecosystem from your guide and catch a glimpse of native wildlife. Plus, hotel pickup and drop-off in San Jose, Alajuela, or Heredia is included.